A crafter's journey, from early works to current projects. SMASH featured on K&Co blog! P.S. Looks like the SMASHblog not longer exists. Oh well. This is for Pixie Dust Studio's food and Mojo Monday #256 challenges. I won the PDS foodie challenge! This is for TGF's Farm Fresh Friday Paper Piecing and Anyone for Anya's Time challenges. This is for TGF's Farm Fresh Fridays Birthday and Mojo Monday #255 challenges. The base is a white 5x6.5" premade notecard with layers of kraft and SU's retired Pawsitively Prints papers. The image is TGF's Anya Celebrates colored in copic and paper piecing, then mounted on dimensionals. The paper backing Anya is from a Build-A-Bear Workshop gift with purchase mini notecard set. The sentiment is stamped on kraft in Jet Black Staz-On, punched with the SU decorative label punch, then mounted with dimensionals. The orange polka dot grosgrain is from Michaels and the knot is placed with glue dots. Update: I won the Anya Spies for 8/26/12 on Splitcoast! Be sure to watch for a project with my newest image coming soon! 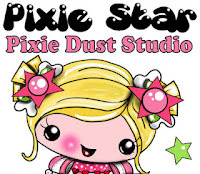 This is for Pixie Dust Studios Pixie Flix "Pretty in Pink" challenge. Who doesn't love a John Hughs movie? While "Pretty in Pink" is not my favorite (Sixteen Candles! ), it still a good movie. Any seriously, who doesn't love Ducky? Here is the other angry birds card I made for one of my bff's sweet boys. The directions and inspiration for this came from Niki and you can find it here. I didn't have all the punches, so I used my Cricut's George and Basic Shapes and some other punches to complete the cards. The card base is Whisper White with layers of Recollections blue argyle and Scrap Around the Blocks sea shells. The sentiment is from SU's retired Grunge Rock. Be sure to visit Niki's blog for the directions and list of supplies. This is for TGF's Farm Fresh Friday Back to School challenge. I decided to make a note holder to use as a teacher gift. The dimensions are 4x6.5". I used a base of Very Vanilla with layers of Bo Bunny Shabby Princess Pep Rally papers and Recollections midnight blue. The border punch is from EK Success. The chalk board is made from the Tim Holtz movers and shapers die in kraft and basic black. I used a craft knife to make scores and swirls in the kraft paper, then inked to give it a slight wood grain texture, inking the edges in Tim Holtz Tea Dye and Vintage Photo distress inks. The writing on the "chalkboard" is a white chalk ink pen. The gem apple is from Swarovski self adhesive crystals images I found on clearance at Michaels. The image is TGF's Cheeky Geeky, colored in copic and paper pieced with coordinating Bo Bunny. I used Clear Stardust gel pen on her glasses, then used liquid glass on the lenses. The last touch is pearl earrings before mounting her with dimensionals. Well, I got involved with working on my card and (of course) I missed my deadline. This was for Pixie Dust Studio Attic Challenge. The base is kraft with layers of 7 Gypsies 6x6 vintage stack and Basic Black. I used nestabilities to make the interior frames, after stitching around the edges of the layers. The top layer is mounted with dimensionals to give it a shadowbox effect. The image is PDS Harvest Mouse, colored with copic, then masked and trimmed with Tim Holtz distress ink in burlap and vintage photo. Each corner has a mini silver brad. The sentiment is from 7 Gypsies, stamped in Versamark on a scrap of coordinating paper and embossed with metallic silver powder. I trimmed the sentiment and mounted it on Basic Black decorative label punch and pearls. I started to make this for a digi challenge at TGF, but failed to get it done...obviously my idea was too big of a scope for the time I had. I barely had them colored and cut before the deadline, let alone finished! LOL Oh, well, such is life. We have had a trying couple of years and have been working to settle into our new life in Ohio. My older two kids were off with the grandparents and we were stuck inside with a rainy day. My youngest was looking out our storm door and started shouting about the colored sky and....there right outside our door was a gorgeous rainbow. Maybe the storm has finally passed and good things are coming our way! Married, SAHM of 3, taxi service, etc. Loves scrapping and stamping, reading, etc.